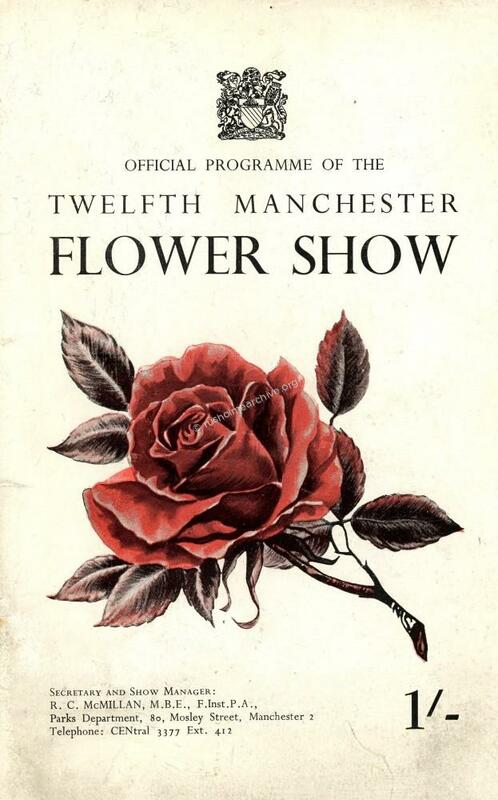 The Manchester Flower Show as displayed in the 1962 cover illustration above did not have a very long history having started only in 1951. “The choice of Platt Fields for the reinstatement of the Royal Botanical & Horticultural Society's Summer Flower Show, or Rose Show, definitely marks the abandonment of the Old Trafford gardens as the official home of horticulture in Manchester”. However the following year the Manchester Horticultural Society reported a loss on that 1919 show and there seems to be no further reference for a flower show in Platt Fields until 1951. ‘Dismal Start to Flower Show – Unkind Weather’. The article said that the Flower Show had got off to a poor start. Dismal weather and inadequate publicity had kept down both the attendance and the number & standard of entries. It continued to say that perhaps the poor standard of entries might encourage ambitious gardeners to make up for lost opportunities next year. In spite of this poor start the Flower Show did continue and was a popular event for over half a century. In 2010 the Friends of Platt Fields produced a centenary booklet that amongst other things gave a brief history of the Flower Show and in particular recorded some of the comments that visitors to the Show had made. The Friends of Platt Fields have kindly allowed me to reproduce this text from page 56 of the Centenary booklet below. “The Manchester Flower and Produce Show was an annual fixture, dating from the 1950s until its demise in 2003. In its heyday this was a major display of 'town and country together', exhibiting the best of fruit and vegetable produce, horticultural expertise and inventions, flowers of every sort, livestock from horses, cats and dogs to guinea pigs and white mice, fashion items, vehicles and machinery, nuts, sweets and trinkets. "The Manchester Show was there every year where there would be everything from flowers, vegetables and all sorts of birds and animals. I loved the horses, especially the huge shire horses, they were my favourites. " "I would so look forward to the flower shows and watching the Red Arrows, painting the sky red, white and blue. It was a much more important occasion than my birthday - a trip there was like seeing the world. " "There was always a stall selling gadgets which would do this and that, peel and dice, chop and slice, keep brass work sparkling and even cure lumbago. They could do everything – but generally ended up at the back of a drawer a few days after you got them home." "The Manchester show was so exciting. The smell of the flowers was overwhelming. We'd love the Police shows on the motor bikes, the horses, and the 'dog shows'. We had a treat to go and visit, and buy a lovely pot of honey and come away on the last day with a pot plant or bunch of flowers." 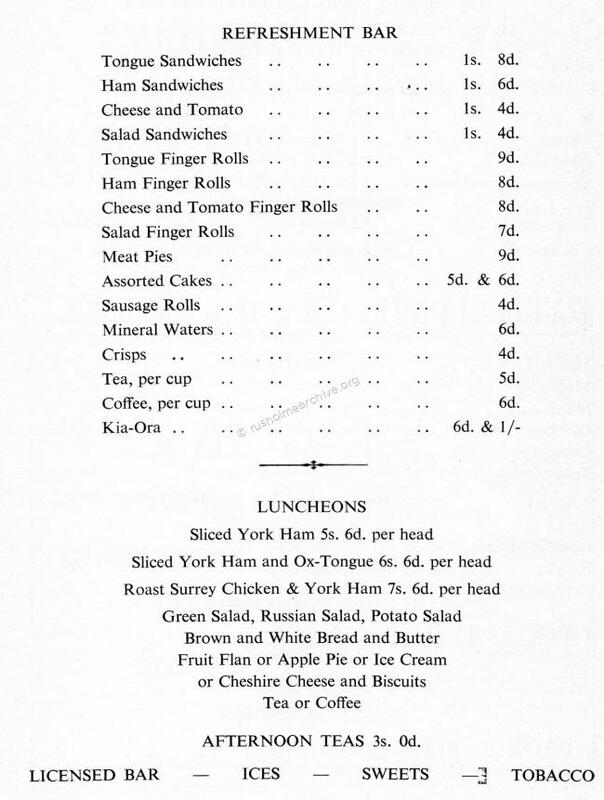 Beneath I have reproduced the page that illustrates the refreshment bar – the prices are quite interesting!